The National Science Foundation (NSF) has invested nearly $80 million in four new Engineering Research Centers (ERCs) to create novel technology platforms to address national challenges in health and energy sustainability. Over the next five years, the centers will create new knowledge and high-tech innovations, as well as transform existing industries in ways that bolster the U.S. economy, support national security and build America's global competitiveness through the preparation of engineering graduates. "For over 30 years, NSF Engineering Research Centers have promoted innovation, helped to maintain our competitive edge, and added billions of dollars to the U.S. economy," says NSF Director France Córdova. "They bring together talented innovators and entrepreneurs with resources from academia, industry and government to produce engineers and engineering systems that solve real-world problems. I am confident that these new ERCs will strengthen U.S. competitiveness for the next generation and continue our legacy of improving the quality of life for all Americans." Multidisciplinary engineering research centers address unique, complex engineering challenges by stimulating knowledge and tech transfer between different sectors, from electronics to energy to infrastructure. Each center takes on a specific engineering research challenge. "The overall goal of the NSF Engineering Research Centers program is nothing less than to revolutionize engineering research and education in the United States," says Dawn Tilbury, NSF assistant director for Engineering. "We look forward to the exciting advances and outcomes in these important areas." The NSF Engineering Research Center for Innovative and Strategic Transformation of Alkane Resources (CISTAR) will develop technologies for responsible conversion of light hydrocarbons from shale gas into fuels and chemicals using a network of portable, modular processing plants. Led by Purdue University in partnership with the University of New Mexico, Northwestern University, the University of Notre Dame and the University of Texas at Austin, CISTAR could enable lower carbon emissions and improved energy efficiency, and provide a viable bridge to a sustainable energy future. The NSF Engineering Research Center for Cell Manufacturing Technologies (CMaT) will develop tools and technologies for the consistent and low-cost production of high-quality living therapeutic cells. Such cells could be used in a broad range of life-saving medical therapies now emerging from research laboratories. 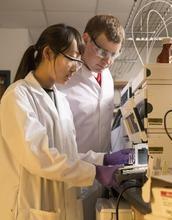 Led by the Georgia Institute of Technology in partnership with the University of Georgia, the University of Wisconsin-Madison and the University of Puerto Rico, the CMaT ERC could revolutionize the treatment of cancer, heart disease, neurodegenerative diseases and other disorders by enabling the use of therapies that utilize immune cells, stem cells and other types of living cells. The NSF Nanosystems Engineering Research Center for Cellular Metamaterials (CELL-MET) aims to transform cardiovascular care by synthesizing breakthroughs in nanotechnology and manufacturing with tissue engineering and regenerative medicine. These breakthroughs could revolutionize our ability to grow large, multi-functional sections of heart and other human tissues. The CELL-MET ERC will be led by Boston University in partnership with the University of Michigan and Florida International University. The NSF Engineering Research Center for Precise Advanced Technologies and Health Systems for Underserved Populations (PATHS-UP) will develop cost-effective technologies and systems at the point-of-care to improve healthcare access for underserved populations. Many U.S. communities have higher rates of chronic diseases, such as diabetes and cardiovascular disease, because healthcare services are unavailable. Health monitoring systems could be seamlessly integrated into people's lives, building on fundamental research to link biomarkers with behavior and optimize medical treatments. The PATHS-UP ERC will be led by Texas A&M University in partnership with the University of California at Los Angeles, Rice University and Florida International University. Since the program's inception in 1985, NSF has funded a total of 74 ERCs and will support 19 in this fiscal year, including the four new centers. Each center receives NSF funding for up to 10 years. During this time, centers build partnerships with industry, universities and other government agencies that will sustain them for years to come. In May, the National Academies published a report, "A new vision for center-based engineering research," which was the result of an NSF-funded study to examine the future of the NSF ERC program. The report identifies and recommends strategies to enable NSF multidisciplinary engineering research centers to continue addressing key research, education and innovation needs of the United States in a changing global context. "ERCs are widely known as outstanding examples of successful partnerships between universities, private industry and government that have made significant contributions to address national challenges," says Don Millard, acting division director for the NSF Division of Engineering Education and Centers. "We are continually working with the scientific and engineering communities, as well as private industry and government partners, to ensure NSF-funded centers and grantees are best-equipped to match societal needs with research abilities." Any new guiding principles for centers or changes to the NSF ERC program will be announced by NSF at a later date. News video available for download.